“I am in a wonderful country” Vincent van Gogh wrote to his brother Theo in 1883. This country was Drenthe. To this day, the province breathes the spirit of years ago. Marvellously preserved megaliths, prehistoric graves, invite the tourist to take a step back in time. This step can be taken at the “Ellert and Brammert” open air museum in Schoonoord. 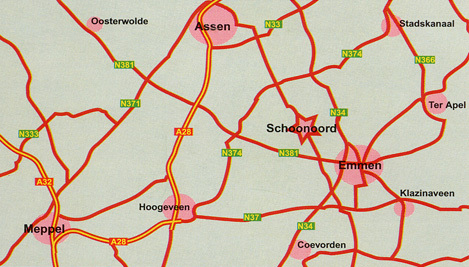 Situated in the Ellertsveld area, this museum brings the past of South East Drenthe back to life. A number of different homes and buildings reconstruct life in the region, starting as small as a turf cottage. But the collection also includes a Saxon farmhouse, a tollhouse, a school and even a prison. Also you can enjoy a snack and a drink at the old country inn. A playground and a childrens farm complete the museum. Group discount (min. 20 persons) €. 1,00 p.p. Open from 30-03-2019 to 31-10-2019. Opening hours : every day from 09:00 to 18:00 hours. Last admissions : 17:00 hours.